So you are looking to get to Israel with your vehicle, or the other way around off course then look no further. I have gathered all the information you need to do just that with Grimaldi lines. If you have any questions left at the end of this article make sure to leave a comment! With Grimaldi you can take a boat from Salerno to Ashdod in Israel. All ports served by their Euro-Med service are: Salerno, Savona, Setubal, Bristol, Cork, Esbjerg, Wallhamn, Antwerp, Southampton, Malta, Piraeus, Izmir, Ashdod, Limassol and Alexandria. 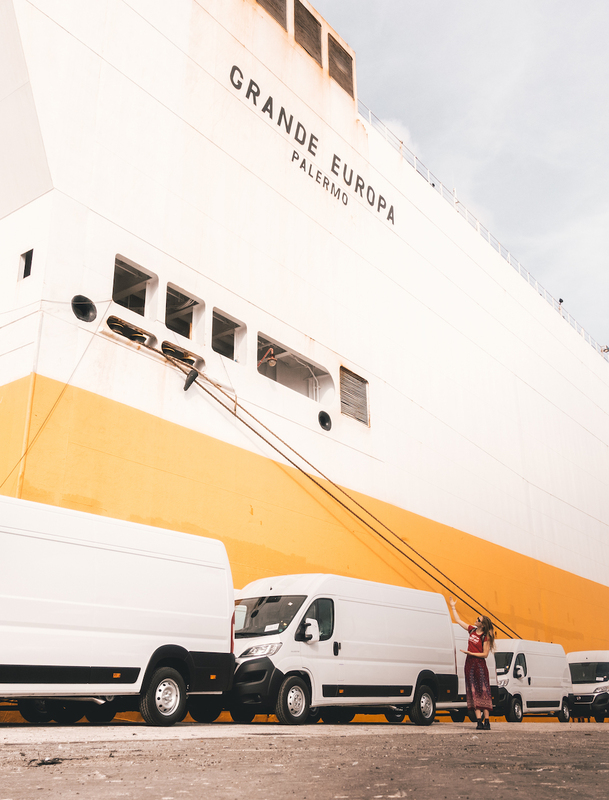 If you are interested in just shipping your vehicle you can pick any port, however as a passenger there are restrictions on where you can onboard/offboard. I know for a fact that there is no boarding happening in Alexandria. Rougly said a ship sails every week, but does not included every port every single time. Contact an agent for more information on your desired dates and routes. Expect to sail anywhere between 5-10 days but even though I called it a ferry earlier it is not. Understand this is a commercial vehicle carrier and part of the unreliable shipping industry so changes in schedule and delays are common. Make sure to be on time when boarding in Europe, keep close contact with your agent and with the port agent and use one of the tracking websites online to see where your ship is now. Customs clearance in Israel 1 day, although Ashdod proudly announces that they are the only port in the world that does not operate 24/7. From sunset on Friday to sunset on Saturday nothing happens and also customs is closed. There are many agents you can book through and the price depends on the cabin you take, how many people and what type of vehicle however it doesn't matter how long the ship will take, you pay for the distance. TOTAL for 2 people and 2 motorcycles €1775; prices will differ depending on the agent you use. Make sure to extend your green card to include Israel, this will save you a lot of money since Israeli insurance is very expensive. You will also have to have insurance for yourself including medical evacuation for if anything happens on board. All in all I loved the time on the sea and time flew by, since I didn’t find any blogs of people who had done this before I didn’t really know what I was getting us into, but that’s just my style. If you are not in a hurry and flexible with your planning this is a great way to Israel and beyond. The Italian chefs, the views from the deck and the time you have to yourself is just amazing. Read the long version of our experience here. You can book directly with Grimaldi however they are notoriously bad in replying, although I have read some reports of people that managed to book with them while calling often. Otherwise use one of the agents mentioned in the list below. If you've found this article helpful, make sure to leave a comment or share this with your friends!